TORONTO — Senior standout Nick Sninchak put on quite a show for the Toronto baseball team during its season opener on Saturday. The Red Knights jumped out to an early lead against Southern Local and never looked back, en route to a 12-2 victory in four-and-a-half innings in an Eastern Ohio Athletic Conference matchup at the Knights Baseball Complex. The Red Knights scored in all four innings in which they batted. Sninchak picked up the win for Toronto. He struck out seven, walked three and allowed two runs on two hits in five innings of work. Caleb Glover started and took the loss for the Indians. He did not record an out, walked all three batters he faced and was charged with allowing three runs to score. Timmy West came in with the bases loaded in the bottom of the first inning. He struck out two without walking a batter and allowed six runs on seven hits. Josh Pratt pitched the fourth, strking out two and walking one, while allowing three runs on three hits. The Red Knights out-hit the Indians, 10-2. Toronto tallied six extra-base hits. Sninchak led the way at the plate, as he collected a pair of doubles and four RBIs. Lucas Gulczynski belted two doubles and drove in three runs. Zac Berger recorded a single, a double and three RBIs. Nick Chetock contributed two singles and two RBIs, while Tristan Thomas doubled and Nate Karaffa singled. Brock Smalley collected a run-scoring double for Southern Local, while West singled. The Red Knights scored four runs in the first, four in the second, one in the third and three in the fourth. The Indians scored both of their runs in the third. 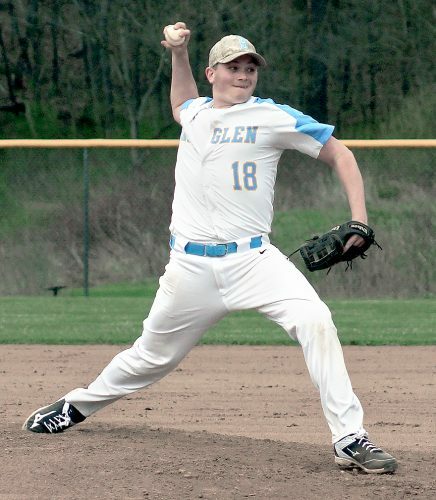 Toronto is scheduled to play EOAC rival Wellsville at 5 p.m. Monday at home, while Southern Local is slated to play EOAC rival Leetonia Monday on the road. SOUTHERN LOCAL (0-1): Glover (LP, 0IP, 3R, 0H, 0K, 3BB), West (3IP, 6R, 7H, 2K, 0BB), Pratt (1IP, 3R, 3H, 2K, 1BB) and Lewis. TORONTO (1-0): Sninchak (WP, CG, 2R, 2H, 7K, 3BB) and Thomas. TWO OR MORE HITS: Southern Local none; Toronto (Chetock 2, Sninchak, Gulczynski 2, Berger 2). DOUBLES: Southern Local 1 (Smalley); Toronto 6 (Sninchak 2, Gulczynski 2, Berger, Thomas). TRIPLES: Southern Local none; Toronto none. HOME RUNS: Southern Local none; Toronto none. RBIs: Southern Local 1 (Smalley); Toronto (Sninchak 4, Berger 3, Chetock 2.